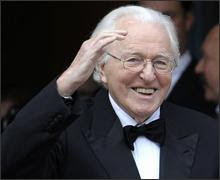 Bloomberg news is reporting that Wolfgang Wagner, grandson of Richard Wagner and director of the composer’s opera festival in Bayreuth for 57 years, died yesterday at the age of 90. Battling ill health, Wagner stepped down two years ago as director of the 134-year-old festival. A seven-year-long family feud over his succession was resolved in September 2008, when the Bayreuth Festival named Wolfgang’s daughters Katharina Wagner and Eva Wagner-Pasquier to lead the annual event. He was a hard-working, strong-minded festival administrator. From 1966 until 1998, he was also an active stage director. Yet he will always be most remembered for who he was, not what he did. His ambivalent legacy as Richard Wagner’s grandson dominated his life, thoughts and work. The Bayreuth Festival takes place every summer in the theater founded by Richard Wagner in 1876. Wolfgang Wagner had a lifelong contract to run the festival and had refused to budge from his post unless his youngest daughter Katharina was named his successor. That led to years of fighting with other Wagners who felt they had a claim, especially Eva Wagner-Pasquier, Wolfgang’s daughter by a previous marriage, and Nike Wagner, his niece. He groomed Katharina to succeed him, nurturing her interest in stage direction and facilitating engagements in leading German-speaking houses. A tireless jetsetter with a restless curiosity in young singers and new stage directors, Wagner was widely criticized for his unbendingly autocratic rule and his refusal to allow the performance of operas not by Wagner at Bayreuth. “Committed to the tradition of his grandfather’s legacy, he succeeded in stabilizing the festival in difficult times and leading it into a secure future,” German Culture Minister Bernd Neumann said in a statement sent by e-mail. “Even though he was himself a rather conservative director, he supported and encouraged ground-breaking interpretations that many saw as provocative,” Neumann said. The artistic revelations of the 1970s and 1980s were the high point of Wolfgang Wagner’s reign, and he was never able to steer the festival back to the forefront of the operatic world thereafter. Still, under his guidance, the festival remained a mecca for operagoers worldwide, with a waiting list of as long as 10 years for tickets.